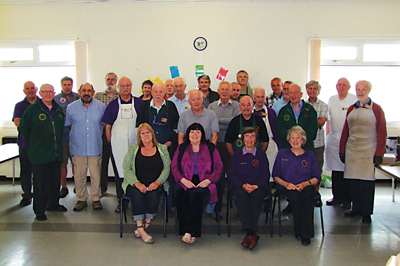 For members of the North Wales and Borders branch of the BWA, the day starts in a blur of activity as tables are put out, the kettle and the boiler are filled and the cake is cut. Oh yes, there is always cake, provided by either Anne or Rita. Their talents are not restricted to carving - they bake as well. Anne has a tea mug that proclaims "I'm not only perfect, I'm Welsh." No argument here Anne. Most of our meetings are of the 'hands-on' type, where we all bring in whatever project we happen to be working on. Apart from these sessions the club's yearly calendar includes a project or two chosen by either Jack, our 'senior artistic director', or Alex. Jack's title is an award no doubt given for being one of our senior members, but also for the sheer skill shown in his work over the years. Jack is one of those people one hears described as the 'go-to guy' nowadays. He'™s always there if you need a little help with any carving problem. The in-house projects ensure that nobody is ever stuck for a choice of subject matter, although there was once some objection when the matter of stopping them was raised on the grounds that in the event of any exhibition, there would just be so many of the same object on the display table. 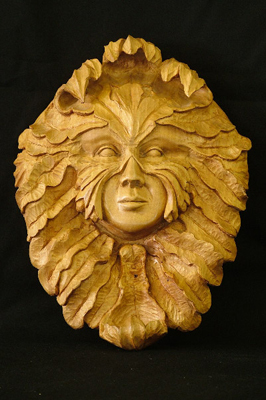 There are several guest carvers who we happily welcome back during the course of the year; people such as the love spoon specialists Sharon Littley and Clive Griffin, or Michael Painter, all of whom bring pre-arranged projects with them. Personally, I can't see how you can be stuck for inspiration or at a loss for something to carve - not when at each meeting there is always some new finished piece on view. These are brought in by members for inspection and from these alone I can easily fill my carving programme for the year. There are members too numerous to mention who can be relied on to bring in something of interest. Alex never lets you down and continually brings in work of a high standard. David Brown's work typifies just how well he has mastered the chip carving style. 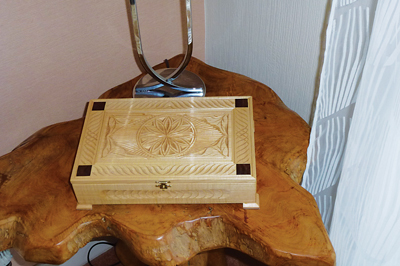 We have two of his boxes at home, one my wife calls her 'bling box' in which she keeps her few pieces of jewellery, and another that houses the family silver. 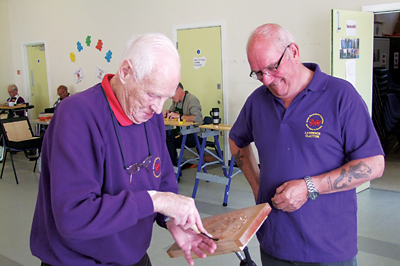 David is another member who is only too happy to share his knowledge and devote a club day to those who wish to try their hand at chip carving, one of which is coming up soon. A person whose work I find really inspiring is Dianne Barratt. Simple to look at, her work has such clean lines, but is always beautifully carved and finished. 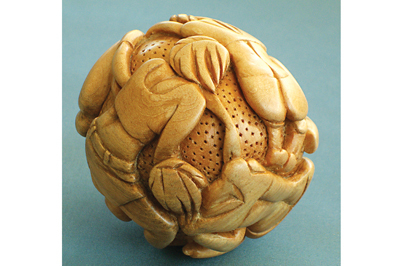 She is currently having a go at some netsuke - I can't wait to see the result. At dinner time, when we all finish whatever lunch we have brought, Eileen, who is our 'chair', rings her bell and makes any announcements. This is followed by 'the joke', and Eileen does have a way with a joke, funnier than many of today's stand-up comedians. Alex then has his turn with his usual appeal of, "Has everybody paid their subs?'. It is then back to the business at hand. I have always believed that the people around you help to make life what it is, whether in day-to-day working life or in the more leisurely pursuits of retirement. I used to play in small dance bands at weekends, and more recently me and my wife have joined a local walking group. 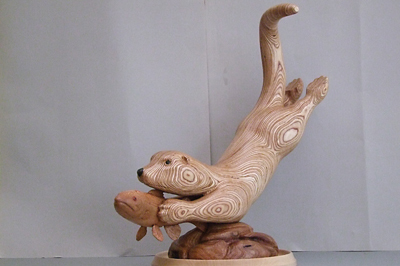 I have been in woodturning groups and I am also in another woodcraft group based in nearby Holywell as well as the BWA. These little snapshots of a few of our members are my way of saying that no matter what you may choose to do, join a club - it will help you to get more out of it. I certainly do.